In today’s business it is appropriate to utilize the strengths of specialists in particular fields to augment and enhance the ability and efficiency of a business entity. This works to the advantage of the overall entity by reducing inventory expense while improving response to customer needs and requirements. One such specialist is Connector Contacts Inc.
We have a full array of equipment to manufacture your custom parts. CNC Swiss Automatics, CNC secondary lathes, Levin lathes, various small mills, drill presses, burrless cross drilling machines, logo & material stamping devices, finishing & deburring cleaning machines, microscopes and optical comparators are just part of our equipment to complete your parts according to your exact specifications. Prototypes, production runs, qualification parts, and short runs are some of the areas we specialize in. Deliveries are fast and scheduled to fit your needs. Prompt attention is given to all quotation requests, just send us a print and the quantity you are requesting, via fax or email, and we will get back to you the same day with our best pricing and delivery time. We are a full service Swiss CNC Machining company created with the sole purpose of tailoring to large connector companies. We are geared, equipped and have the know how to machine contacts out of all type of electronic materials. 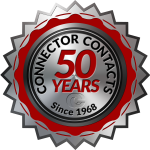 © Copyright 2009-2019 Connector Contacts, Inc. All Rights Reserved.